BUYSOUNDTRAX Records presents the original motion picture soundtrack for THE FOURTH PROTOCOL, featuring music composed by Lalo Schifrin (BULLITT, MISSION: IMPOSSIBLE, ENTER THE DRAGON) for the 1987 spy thriller directed by John Mackenzie (THE LONG GOOD FRIDAY), based on the novel written by Frederick Forsyth, starring Michael Caine, Pierce Brosnan, Ned Beatty, Joanna Cassidy, Michael Gough, Julian Glover, Ray McAnally, Ian Richardson, Anton Rodgers, Alan North, Betsy Brantley and Matt Frewer. THE FOURTH PROTOCOL is a stylish cold war chiller based on Frederick Forsyth’s novel of the same name. The film was released in 1987, just as Soviet leader Mikhail Gorbachev began to introduce the liberalizing reforms of perestroika and glasnost that would result in the collapse of the Soviet Union. In Forsyth’s 1984 cold war thriller, renegade parties within the Soviet Union, led by KGB Chairman Govorshin and British defector Kim Philby enact a plan to set off a nuclear bomb near an American airbase in England, intending to destabilize NATO and bring about an anti-NATO, anti-American and pro-Soviet government to the UK. The title refers to a fictional element of the 1968 Nuclear Non-Proliferation Treaty, which in the world of the novel contained four secret protocols, the last one a prohibition on non-conventional means of delivering nuclear weapons. In violation of that protocol, Govorshin and Philby mean to detonate an atomic bomb by shipping parts in secret to England where a Soviet spy will secretly assemble and activate the device nearby the target airbase. KGB agent Major Valeri Petrofsky (Brosnan) is singled out by KGB Chairman Govorshin (North) as the undercover operative who will receive the parts in England and, after assembly, activate the bomb. Enter MI-5 agent John Preston (Caine), a no-nonsense British spy whose intuitive success puts him at odds with his superior, acting MI-5 director Brian Harcourt-Smith (Glover), whose overt dislike of Preston gets his subordinate transferred to MI-5’s equivalent to Siberia – the Airports & Ports division. As luck would have it, this is exactly where Preston will find his first clue, which sets him onto the nature of the Soviet plot. This discovery will point him toward Petrofsky and his collection of bomb parts. The two trails eventually merge in the climax as Preston confronts Petrofsky and learns the truth about THE FOURTH PROTOCOL. To score THE FOURTH PROTOCOL, the producers hired Lalo Schifrin. His music for the film is a rare example of the composer scoring an action film orchestrally. While his musical roots in jazz have found their way into his best-known scores, Schifrin has always shown himself proficient with orchestral scores, although the majority of his modern action scores have largely embodied a modern jazz musical milieu. As a result, THE FOURTH PROTOCOL is a kind of cousin to his orchestral score for TELEFON, in which Charles Bronson played a Soviet agent sent on a covert mission into the US. Like that earlier score, the music for THE FOURTH PROTOCOL is played mostly in the dark registers – lots of cello, bass clarinet, and bassoon evoking the dark possibilities inherent within the film’s title. Schifrin’s music for THE FOURTH PROTOCOL is not generally a character-driven score. With few exceptions, he uses the music to drive the story’s action rather than evoke personalities and perceptions. As a pianist, composer and conductor, Lalo Schifrin is equally at home conducting a symphony orchestra, performing at an international jazz festival, scoring a film or television show, or creating works for the Los Angeles Chamber Orchestra, the London Philharmonic and even The Sultan of Oman. As a young man in his native Argentina, Lalo Schifrin received classical training in music, and also studied law. He came from a musical family, and his father, Luis Schifrin, was the concertmaster of the Philharmonic Orchestra of Buenos Aires at the Teatro Colon. Lalo Schifrin continued his formal music education at the Paris Conservatory during the early 1950s. Simultaneously, he became a professional jazz pianist, composer and arranger, playing and recording in Europe. When Schifrin returned to Buenos Aires in the mid 1950s, he formed his own big concert band. It was during a performance of this band that Dizzy Gillespie heard Schifrin play and asked him to become his pianist and arranger. In 1958, Schifrin moved to the United States and thus began a remarkable career. Lalo Schifrin has written more than 100 scores for films and television. Among the classic scores are MISSION IMPOSSIBLE, MANNIX, THE FOX, COOL HAND LUKE, BULLITT, DIRTY HARRY, THE CINCINNATI KID and THE AMITYVILLE HORROR. Recent film scores include TANGO, BRINGING DOWN THE HOUSE, THE BRIDGE OF SAN LUIS REY, AFTER THE SUNSET, ABOMINABLE, RUSH HOUR, RUSH HOUR 2 and RUSH HOUR 3. Among Schifrin’s conducting credits are the London Symphony Orchestra, the London Philharmonic Orchestra, the Vienna Symphony Orchestra, the Los Angeles Philharmonic, the Israel Philharmonic, the Mexico Philharmonic, the Houston Symphony Orchestra, the Los Angeles Chamber Orchestra, the Mexico City Philharmonic, the Atlanta Symphony Orchestra, the Orchestra of Saint Luke (New York City), the National Symphony Orchestra of Argentina, the Sydney Symphony Orchestra, and the Lincoln Center Chamber Orchestra. 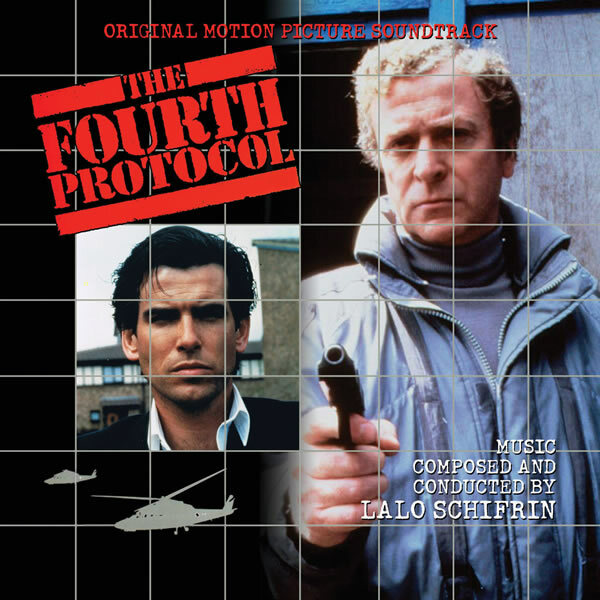 Originally released in 1987 on vinyl by DRG and on compact disc the same year by England’s Filmtracks label, THE FOURTH PROTOCOL was one of the first soundtracks to be released on compact disc, and one of the most elusive. The original CD release had some sonic issues and fans of the composer have been waiting a long time for that to be addressed. Buysoundtrax is excited to present a new compact disc release of THE FOURTH PROTOCOL, with liner notes written by author Randall Larson and new mastering from Digital Outland, making it possible to completely enjoy all the details of Lalo Schifrin’s music for the film. THE FOURTH PROTOCOL is a limited edition release of 1000 units.